10 new and exclusive works and 2 hours of music. What if artists composed music for a better place? c.sides asked ten diverse artists and bands to create exclusive new works, sharing one goal: to make a humble contribution toward making this world a better, more just and beautiful place simply by doing what they can do best: make art and create music, and to embark on a mission of re-exploring the notion of meaning and impact in and through music. Artists had full freedom in their creative process. c.sides provided only general guidelines to participating artists regarding the project’s concept and an intended timeframe of ten to fifteen minutes for each piece, in order to allow the artists to develop an idea beyond the limitations of a ‘regular track.’ c.sides also encouraged artists to work with different musical means than they usually would. The compilation consists of studio versions of the works. In addition, the pieces were performed and / or screened live on one stage on May 12th, 2011 at the Haus der Kulturen der Welt, as part of the HKW Lokal program within the Über Lebenskunst Initiative. 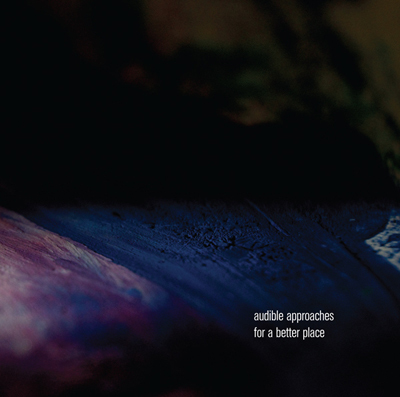 Video and recordings from the evening will be made available on the Audible Approaches website towards the release date. The opening track features a first-time collaboration between German electronic producer Glitterbug and Israeli-Palestinian Arabic Soprano opera singer Enas Massalha. ‘The Sky Fell Silent’ was conceived and recorded during the early days of the 'Arab Spring', a time of civil uprising and revolutionary wave of demonstrations that triggered a personal investigation of transition and uncertainty, a free-falling of music and words into an unknown fate or future. Eliad Wagner, an Israeli musician, composer and programmer currently living between Amsterdam and Berlin, takes an Arp 2600 (yes, the vintage hardware version!!) to an arpeggio journey of ‘Exile’, an analogue downpour rolling and building playfully in tear-wrenching beauty until creating a sense of familiarity and comfort. The young Christian Löffler taught himself the essentials of making electronic music at a young age in a secluded part of north-eastern Germany, and through that developed his personal, deep, moving, melancholic sound. ‘Cast’ is a beautiful example of the extraordinary capacities of this producer and visual artist, weaving text, animation and sound to a delicate web of scattering emotion. His hand drawn animation will be available for viewing along with the release. The master of the stage, unstoppable and never-resting Can 'Khan' Oral always has to stand out of the pack - distinct, wild and glamorous! ‘Shahane’, the turkish word for beautiful, is a meditative work that builds over ten minutes and tells the story of the centuries old Turkish- Armenian cymbal makers Zildjian. Documenting, filming and recording ventilation points, aerating tunnels and air conditioners, Gold Panda created a musical breathing machine, ‘Air’. His elongated faint exhale is embellished with sonic disturbances of glitches, cracks and clicks filled with his remarkable amiable charm of digital errors. The trio that needs no introduction, Brand Brauer Frick, took the challenge and allowed themselves to experiment, improvise and play even more than usual, dynamically caroming tones and beats with one another. ‘Schwan’ carries their unmistakable BBF sound yet it's both pleasing and challenging, delightful yet timid. The track continues to build and drop precise musical structures, toying with the borders between perfect control and total eruption. Award winning pianist and composer John Kameel Farah is a virtuosic keyboardist simultaneously using piano, synthesizer and computer sequencing. ‘Mountain Hymn’ is no exception to the unique merging of improvisation, middle-eastern texture, baroque counterpoint and electro-acoustics by this prodigious artist. Citing a multitude of musical sources, including English composer Elisabeth Lutyens, Farah created a dense composition of sonic surprises. Trying to break the dictatorial process for musicians playing in a composition, Jasmina Maschina, created a participatory approach. She provided musicians with four notes; E, G, A & B. The musicians could perform them in any variation, duration and register, thus, relinquishing some of her authorship of ‘Romantic Rebellion’. The live performance of the piece took this approach even further by having the musicians moving through the auditorium in total darkness, creating a shifting and less stereophonic listening experience. Re-exploring voice as an instrument and carrier, Glitterbug’s vocal edit of ‘The Sky Fell Silent’ brings Enas Massalha as a self replicating choir, allowing her own voice to collide in repeating patterns and oscillations over the original silent musical. Whether an appeal, or a call, ‘The Sky Fell Silent’ calls on the listener to perform their single duty to it's fullest extent - to listen. For the first time ever, the voice of EFTERKLANG, Casper Clausen, joined the band's electronic maestro, Mads Brauer and filmmaker Karim Ghahwagi to create a new collaborative audio-visual work. The result is a stunning score AND short animated film titled 'The Figment Notebook', adark fairytale written and animated by Ghahwagi. Brauer and Clausen's soundtrack is featured, with and without Sara Davis's narration, on the compilation CD, the full film will be featured on the Audible Approaches website nearing the release date.